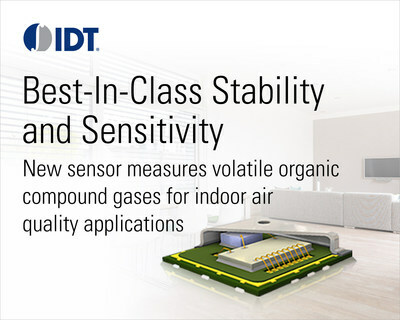 IDT Expands its Flagship Integrated VOC Gas Sensor Line With Solutions for Indoor Air Quality Applications | Integrated Device Technology, Inc.
SAN JOSE, Calif., June 21, 2018 /PRNewswire/ -- Integrated Device Technology, Inc. (IDT) (NASDAQ: IDTI), today launched its new ZMOD™ family of integrated gas sensors that offer best-in-class stability and sensitivity for measuring volatile organic compound (VOC) gases. These sensors are ideal for indoor air quality applications, including smart thermostats, air purifiers, smart HVAC equipment and other "smart home" devices. "ZMOD builds on the established success of our SGAS line of sensors to give product designers and manufacturers more choices and flexibility in creating new products," said Mario Montana, vice president and general manager of IDT's Automotive and Industrial Group. "Our team of engineers have a wealth of experience in gas sensor technology as well as ASIC design and have used this experience to create a leading edge platform of integrated and intelligent gas sensors. These sensors possess an ideal mix of features, performance, stability and reliability, enabling a new generation of environmental sensor applications ranging from industrial and appliance applications to IoT and smart home devices." The IDT® ZMOD gas sensors have several advantages, including its advanced ASIC-based hardware platform that enables software configurability allowing for a rapid release of new sensing capabilities from one platform. Another significant advantage is that the sensors are based on IDT's 12-year history of producing and shipping metal oxide (MOx) materials, which gives ZMOD devices superior sensitivity and reliability. Actual performance data is available dating back to 2005. The ZMOD sensors are also electrically and chemically tested to ensure consistency from lot to lot, an important advantage for manufacturers with long production runs. ZMOD devices offer best-in-class reliability as a result of receiving complete qualification for harsh use cases – such as siloxanes – and from an unprecedented life characterization. The ZMOD4410 is the first member of the ZMOD family. It is available in a 12-pin LGA assembly that measures 3mm x 3mm. Visit idt.com/gas to learn more and request samples and evaluation kits, or contact your local IDT sales representative.